LaQuantae Davis is an undergraduate student at the University of Washington in Seattle. She is passionate about helping people and has a strong desire to learn as much as she can about her African American history and culture. She hopes to embark on a pre-medical educational journey at the University of Washington to further her dreams of becoming a surgeon. 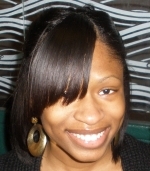 She also plans to graduate from the university with a degree in African American Studies.